High School Student Aims High To Become Fighter Pilot - USA Patriotism! It's not every day that civilians get to sit in the seat of an F-15 Eagle Fighter Jet. But for high school student and aspiring fighter pilot, Dakota Fabre, he got to do just that at the Louisiana Air National Guard’s 122nd Fighter Squadron at Naval Air Station Joint Reserve Base New Orleans in May 2018. 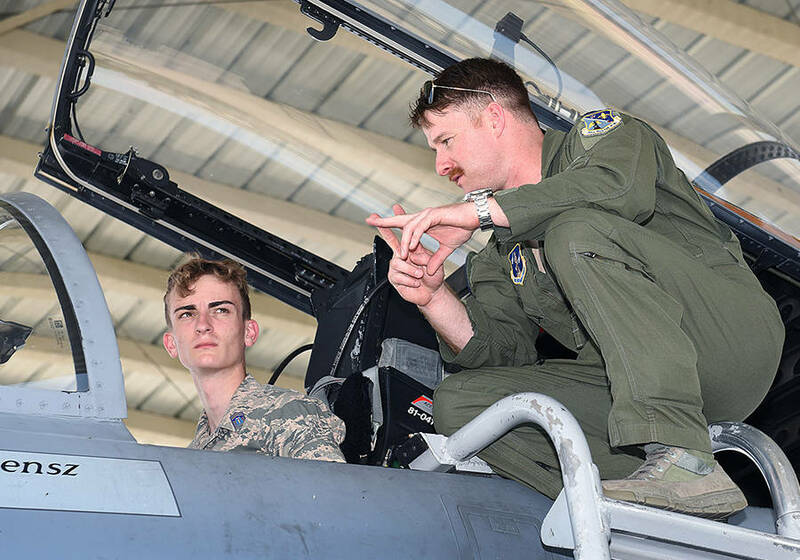 Fabre, an Air Force Junior Reserve Officers' Training Corps cadet at Destrehan High School, in Destrehan, took part in the Air Guard’s new program to mentor possible future pilots to give those interested a look behind the scenes. “My brother is currently going through ROTC in college to become a pilot and it would really be cool if we were both [fighter] pilots in the Air Force,” said Fabre, who will be a junior in August. Fabre was given the opportunity to attend an actual pre-flight pilot briefing on how to strafe ground targets and perform strafing maneuvers in the F-15 fighter aircraft. Capt. Timothy Mundschenk, an F-15 fighter pilot, gave Fabre the tour. Fabre was shown some of the flight equipment pilots wear, such as their harness, anti-gravity suit and the high-tech helmet that aids them in completing their mission. Fabre was escorted onto the flight line to watch several F-15s take off for a training mission and was able to tour a parked jet up close. Mundschenk explained the different parts of the jet and allowed him to sit in the cockpit to feel what it’s like to be in the driver’s seat. Mundschenk gave Fabre a glimpse into what he does when he’s not flying. Things like scheduling flights, staff meetings and recruiting new pilots are all additional duties that come with the job. For Fabre’s final “pilot shadowing” experience, he was given an opportunity to pilot a fighter jet in the squadron’s state-of-the-art F-15 flight simulator.